Pairing your digital thermostat with a heated mattress pad for your beds is a cost-effective way to cut your heating costs and stay warmer. When we tell friends we use heated mattress pads they immediately assume we mean electric blankets. While similar, mattress warmers differ in an important, energy-saving way – they cover the mattress, warming you from underneath with the rising heat instead of from above where most of the heat winds up in the room. Most of the current models come with variable zones that heat your feet a little more than your torso and don’t heat your head at all. Set your digital thermostat low at night when you go to bed. It won’t matter how cold the house gets, you’ll be warm and toasty. Then have the heat kick on about 30 minutes to an hour before you rise in the morning to a nice warm house. Twin-size warmers come with a single control and you can get full-size warmers with single or dual. Queen sizes and up include two controls so each of you can stay as warm or as cool as you like. 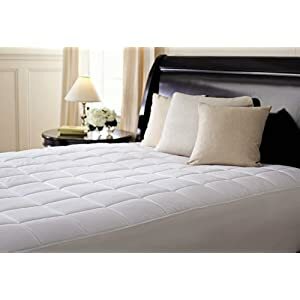 You can buy heated mattress pads anywhere from Wal-Mart to Macy’s and the cost varies with the thread-count like most bedding. However, since these will be hidden under your sheets you’re the only person who’ll ever see them.